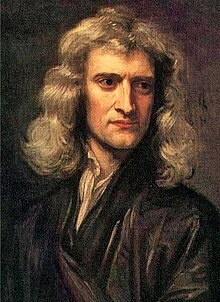 Sir Isaac Newton (4 January 1643 – 31 March 1727) was an English physicist, mathematician, astronomer, natural philosopher, alchemist, and theologian, and is considered by many scholars and members of the general public to be one of the most influential people in human history. His Philosophiæ Naturalis Principia Mathematica (Latin for "Mathematical Principles of Natural Philosophy" usually called the Principia), published in 1687, is one of the most important scientific books ever written. It lays the groundwork for most of classical mechanics. In this work, Newton described universal gravitation and the three laws of motion, which dominated the scientific view of the physical universe for the next three centuries. Newton showed that the motions of objects on Earth and of celestial bodies are governed by the same set of natural laws, by demonstrating the consistency between Kepler's laws of planetary motion and his theory of gravitation; thus removing the last doubts about heliocentrism and advancing the Scientific Revolution. In mathematics, Newton shares the credit with Gottfried Leibniz for the development of differential and integral calculus. He also demonstrated the generalised binomial theorem, developed Newton's method for approximating the roots of a function, and contributed to the study of power series. In 1679, Newton returned to his work on mechanics namely gravitation and its effect on the orbits of planets, with reference to Kepler's laws of planetary motion. This followed stimulation by a brief exchange of letters in 1679-80 with Hooke, who had been appointed to manage the Royal Society's correspondence, and who opened a correspondence intended to elicit contributions from Newton to Royal Society transactions. In this work, Newton stated the three universal laws of motion that enabled many of the advances of the Industrial Revolution which soon followed and were not to be improved upon for more than 200 years, and are still the underpinnings of the non-relativistic technologies of the modern world. Newton made clear his heliocentric view of the solar system – developed in a somewhat modern way, because already in the mid-1680s he recognised the "deviation of the Sun" from the centre of gravity of the solar system. With the Principia, Newton became internationally recognised. He acquired a circle of admirers, including the Swiss-born mathematician Nicolas Fatio de Duillier, with whom he formed an intense relationship that lasted until 1693, when it abruptly ended, at the same time that Newton suffered a nervous breakdown.